Begun in the late summer of 1880, this large work is a sequel to Dance at the Moulin de la Galette of 1876 and treats the same subject as a smaller scale work of 1879-80. The location is the Restaurant Fournaise on the island of Chatou in the Seine, west of Paris, and was a popular meeting place for rowers. The models for several of the figures can more or less be certainly identified. Standing on the left is the testaurant owner Alphonse Fournaise and on the chair next to him, with a dog, is Aline Charigot, latet Renoir's wife. Seated in the right foreground is Caillebotte, while to his left is possibly the model Ellen Andree or the Montmartte model Angele, with the Italian journalist Maggiolo. The top-hatted figute in the background is the rich collector and amateur writer Chatles Ephrussi. Leaning on the terrace is possibly Fournaise's daughtet Alphonsine, talking to Baron Raoul Barbier, an ex-cavalry officer and friend of Maupassant as well as of Renoir. In the right-hand corner are Renoir's friends, the journalist Lhote (in the straw hat) and the government official Pierre Lestringuez. In contrast to Dance at the Moulin de la Galette, this work is much more strongly composed and modelled. There are fewer figures and each is more individualized, and the whole is set in a more enclosed space. Renoir constructed various visual links between the elements, for example, through the similar outfits of Fournaise and of Caillebotte, and through the scattered straw hats and the accents of red on various details. Space is also compressed such that the foreground figures are disproportionately sized in comparison with those in the background. 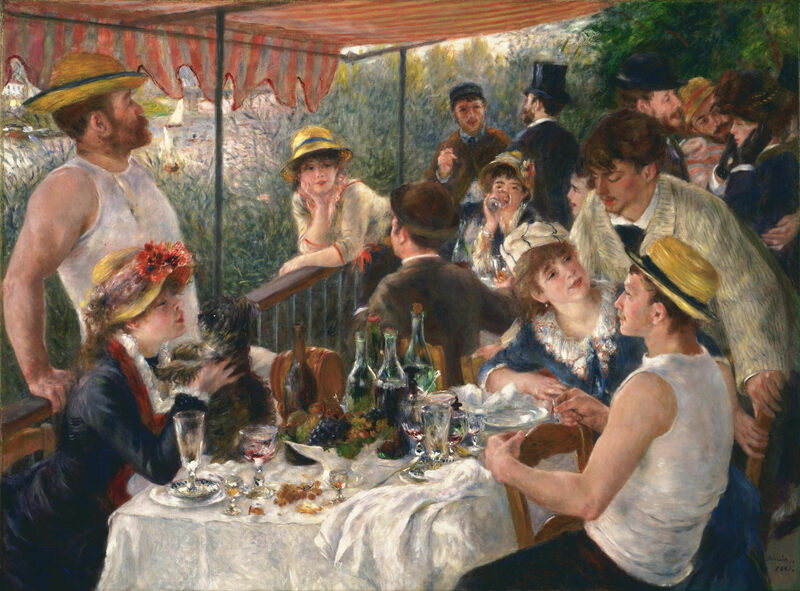 However, this structure serves only pictorial ends: Renoir makes no attempt to forge any narrative links between the characters as would traditionally have been expected of a genre scene. In execution, the painting shows Renoir moving away from the open air light effects of Dance at the Moulin de la Galette. Filtered through the awning, the light is diffuse and largely uniform leading to none of the mottling effects of the earlier work. With the richly painted still-life of the foreground, the picture has resonances with Renaissance and Baroque banquet scenes, and communicates a sense of relaxed, convivial enjoyment.